Family Reading Partnership programs and initiatives provide books and encouragement for families to make reading aloud to their children a part of everyday life. Click on any program below to learn more about program objectives, book selection, sponsors, and history. Get ideas for programming in your own community! 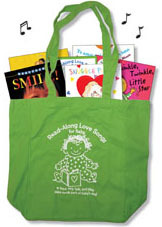 Beginning with a prenatal visit (Waiting for Baby), then at birth (Welcome Baby), at Well-Visits from age 2 months to 4 years, and then at kindergarten registration (Welcome to School Book) families receive a book as a gift from a respected professional in the family’s life with encouragement and support to make reading aloud part of every day. 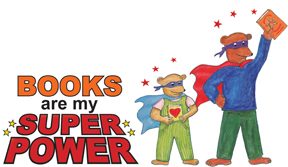 Gently used children’s books are available free for families to take home on over 50 red bookshelves in the community. Volunteer readers visit childcare homes and centers every 2 weeks with a crate of books they leave for children to enjoy until the next visit. Use your grocery shopping time to engage your baby or young child with word play. 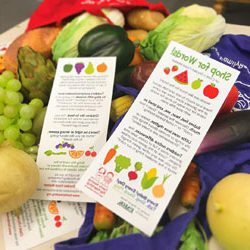 Pick up a Shop for Words card as you enter the grocery store and find words as you shop. 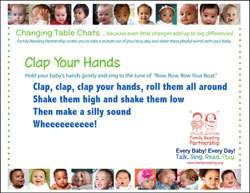 Give your baby words with fun rhymes posted at changing tables in public restrooms around Ithaca and Tompkins County, NY. Take a walk through a book in parks within Tompkins County, NY. 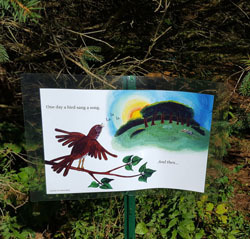 Children’s book pages mark the way along a path you can explore with your child. Income eligible expectant parents are given a bag of board books for their baby with a CD of the books being read and sung. Home visitors support the family by encouraging readying to baby as soon as it is born. Head Start families receive a children’s book at a home visit and support and encouragement to make read-aloud part of everyday family life. All across the community, billboard-sized banners with colorful images of reading together encourage and inspire families to read to their children. This initiative enhances existing programs that serve families with babies and adds new programming to deepen and strengthen the message to read to baby from the very start. A 5K run held annually to benefit Family Reading Partnership, this event is held in memory of Mario St. George Boiardi, a former Cornell University lacrosse player and team captain. Read aloud every day for one month in your classroom or family to instill a love of reading in your children. Lots of activities and book suggestions. Plan your own celebration of children’s books and reading together with arts and crafts, performances, book stations, and storybook characters in costume. Download ideas! This engaging book, DVD, and CD set uses music, motion, and colorful illustrations to teach the letter recognition and letter sounds. Want to give local families more books at the holidays? 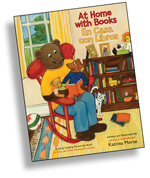 Collect new books and distribute them using the networks in your community that already serve families. Read about how singing makes language accessible to people who may not have strong literacy skills. Every family whose baby is born in our local hospital receives a children’s book as a gift in a bright red bag. The Bright Red Bookshelf is supplied with gently-used books donated by individuals or collected by groups such as these Daisy Scouts. Parents and children connect to books and each other through singing and reading.